First line: Everyone was calling it the wedding of the century. 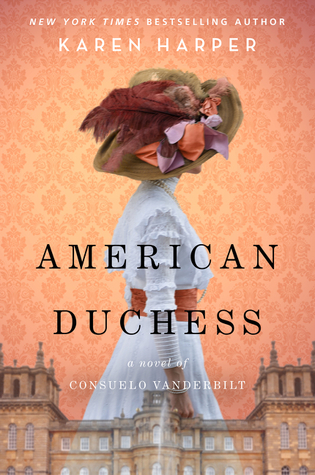 Summary: Consuelo Vanderbilt, the American heiress to the railroad empire, is marrying the future Duke of Marlborough. However, she is in love with someone else and is being forced into the marriage by her strong willed mother, Alva Smith Vanderbilt. The marriage is an unhappy one but Consuelo hopes to use her influence as the Duchess of Marlborough to help the lower classes living around Blenheim Palace. My Thoughts: I have been a reader of Karen Harper for many years. I really enjoy her historical fiction even though she seems to elaborate her narratives a bit. Her most recent novel was a fast read about one of the American heiresses whose money helped sustain the British aristocracy. Having recently read, A Well-Behaved Woman by Therese Anne Fowler, I was familiar with the Vanderbilt family at the turn of the nineteenth century. Alva was a force to be dealt with but it sounds like her daughter learned a lot from her mother. I loved hearing about Consuelo’s life and the way she tried to improve her circumstances and those of the poor. I cannot imagine living her life though. She was forced into a marriage, had unimaginable wealth and was very unhappy for many years. Harper does a great job of breathing life into her characters. I loved “meeting” Winston Churchill. As with most historical novels, I googled many of the locations and people to see what they really looked like. This was a fun romp through the Gilded Age and into the time of the world wars. FYI: This is perfect for fans of Downton Abbey!